More than a thousand people attended the first Team CBRNE (Chemical, Biological, Radiological, Nuclear and Explosives) Capabilities Showcase on Aug. 5-6 at the Edgewood Area of Aberdeen Proving Ground. Congressional stakeholders, industry partners and government personnel attended the two-day event to learn more about how Team CBRNE is becoming the nation’s center of excellence for defense efforts that counter threats of weapons of mass destruction (WMD). “The Team CBRNE Capabilities Showcase is a great way for our scientists and engineers to engage with their peers and potential business partners on some of the most innovative projects in CBRNE defense,” said Edgewood Chemical Biological Center (ECBC) Director Joseph Wienand. The event was hosted by the Joint Program Executive Office for Chemical and Biological Defense (JPEO-CBD) Team CBRNE is made up of a number of organizations located at Edgewood, including ECBC, JPEO-CBD, the 20th Support Command, the Defense Threat Reduction Agency-Joint Science and Technology Office, the Chemical Materials Activity, Program Executive Office-Assembled Chemical Weapons Alternative, U.S. Army Medical Research Institute for Chemical Defense, and the U.S. Army Public Health Command. Countering WMD threats has been at the heart of Team CBRNE capabilities, and it is ECBC’s mission to continue to provide innovative support to the Warfighter in the years ahead. The event was an opportunity for ECBC employees to network with stakeholders both inside and outside the fence. Emanuel is the program lead for the Joint USFK (United States Forces Korea) Portal and Integrated Threat Recognition Advanced Technology Demonstration (JUPITR ATD), a four-year collaborative effort between ECBC and JPEO-CBD that currently provides the Korean Peninsula with unique biosurveillance capabilities. The Team CBRNE Capabilities Showcase focused on four commodity areas, including Detection, Protection, Decontamination and Elimination. Attendees were able to interact with technologies from the Warfighter perspective, walking through the story of how soldiers in the field need to be equipped with detectors that can identify and confirm trace amounts of hazardous CBRNE materials, and then protect themselves with the latest personnel protective gear, whether it is collective or individual protection. Next, decontamination methods are used to neutralize the threat or clean contaminated areas. Finally, Team CBRNE is committed to WMD elimination efforts that demilitarize stockpiles of chemical agent. The Field Deployable Hydrolysis System (FDHS) was on display as the latest transportable elimination technology is currently being used to destroy Syria’s chemical agent stockpile onboard the M/V Cape Ray. Collaboration across Team CBRNE organizations has catalyzed some of the latest advances to counter WMD threats. 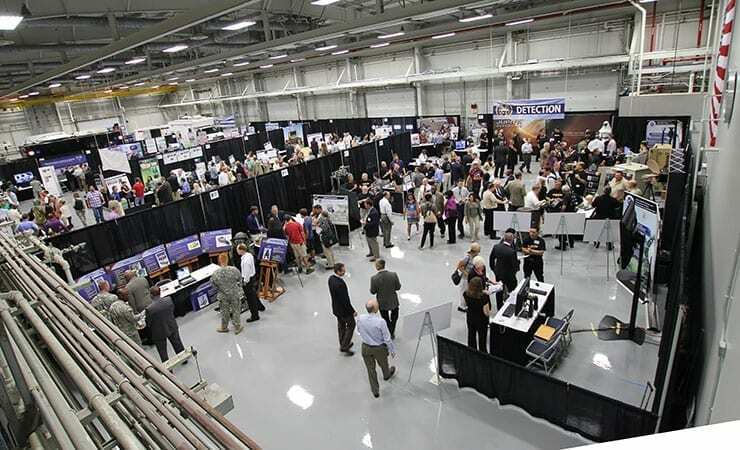 The Showcase enabled employees to gain exposure with potential government partners as well as build industry relations. As a part of Team CBRNE, ECBC continues to find new ways to apply its research, engineering and field operations capabilities, making it a national asset to furthering the Department of Defense mission for years to come.